With guaranteed OEM authentic projector lamps, you’ll never experience the frustration of down time from a projector ruined by a defective lamp. Three important things to watch for: Arc distance, wattage, reflector size. Health and safety is always important. One of the associated risks from DLP projectors is exposure to high-intensity projector lights that can damage eyesight. Genuine PHILIPS lamps are manufactured with UV coated reflectors to reduce harmful rays and protect your eyesight. Generic lamps don’t offer this safety feature. PHILIPS is the premier manufacturer projector and TV lamps. They have spent years researching and developing the sophisticated technology of projector. Here are three things to look for with authentic projector lamps. 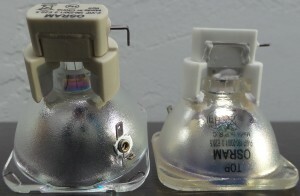 Projector bulbs have an arc gap filled with ultra-high pressurized mercury vapor that creates the high intensity light needed to project the image onto the screen. There is an optimal arc distance needed in every projector lamps that is 1.0 mm. Getting this exact measurement takes the right equipment and even the slightest deviations from this exact measurement can result in loss of contrast, brilliance and light eventually damaging the optical components on the projector. Wattage plays a critical role in lamp power as it supplies the amount of light displayed. Generics usually have higher wattage and when they come in contact with the low wattage ballast/driver (which controls the electrical ignition of the lamp), the projector’s electrodes can be damaged. Since the generic lamp produces too much light, there is often a flickering image, uncontrolled light exposure and overheating of the lamp and projector. Generics often have a different sized reflector than original OEM lamps, which means they often don’t fit into the projector properly. Bad position of the lamp means the light does not go through the optical elements at the right angle causing damage to the optics and a short circuit of electrical components. This leakage of light can also affect your eyesight by exposing you to high intensity light.